The first installment of The Hunger Games trilogy helps identify the series as a futuristic style movement. Take a cue from the Capitol hairstyles and incorporate them into your own life! In the Capitol, inhabitants opt for brilliant versions of techicolour instead of the drab hues normally associated with the general population of the districts. Colour helps identify this city as omnipotent with a unique quality that isn’t commonplace in any other district of Panem. The tendency is to opt for a more showy, brilliant version of style. The larger than life persona of the people of this district can be attributed to the use of colour as well as the visual style that helps define this avant garde metropolis known as the Capitol. Colour and style work together in symbiotic harmony to help identify the Capitol’s desire to create a fashion forward society that oozes future sophistication and as such, removes itself from any association from the districts. Do you want to stand out as well? Create a personal style that commands attention? If so, think outside of the norm with these hairstyle ideas inspired by The Hunger Games. 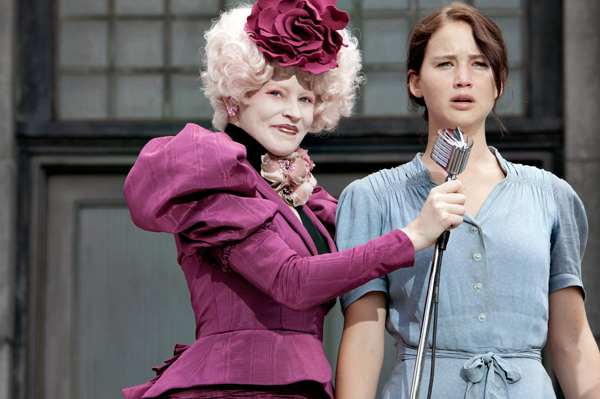 Effie and the District 12 stylists chose colour to make make a statement. As Capitol city fashionistas, they opted for such personal hair colours such as pink, aqua or orange. Brightly hued hair was undoubtedly a major beauty focus in this futuristic world, but colour shouldn’t stop there. In your world, opt for strong highlights. For blonde hair, choose bright sunshine inspired highlights such as platinum or bright gold, or go for low lights in brown or black instead. With brown hair, opt for copper or golden accents and with black hair pick maroon or purple hues to add a colour punch. Take the risk and add a streak of your favourite colour. Add a long streak of bright blue to your gorgeous brunette hair, maybe a swoop of silver to highlight to your perfect black mane or a pink strip to add interest to your amazing blonde hair. The choice is yours! Add a streak (or few) of your favourite colours to bring out your own unique style. Yes… colour plays as important part in your your personal look — but so does style. To get Capitol inspired hair, consider that the bigger and more creative the better. Choose to blow dry your hair upside down for maximum volume then play with texurizing products to create full volumious locks. Finger style your ‘do to create waves and swooping curls. If you choose to play it slick like Haymitch, use a smoothing product to keep stray hairs in line. Take a style risk and run with it — grab a style opportunity and make it your own.